Mark the date and begin promoting your brand with this imprinted wall calendar! Comprised of paper stock and a UV-coated cover, this 13-month staple-bound calendar has a stunning display. High-quality imagery increases this calendar’s design, shaping it into a beautiful calendar. View previous and following months atop this customizable calendar. Designed out of 60# glossy paper, this calendar will shine! 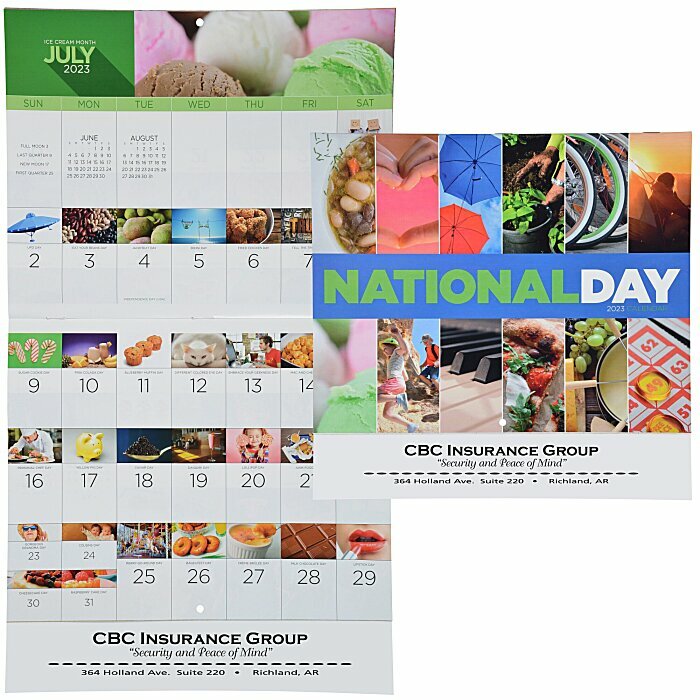 Promote your brand on the bottom strip of this staple-bound calendar. Boasting a wide variety of different National Days, you can stay in the loop and celebrate something new every day! Your price includes one color imprint on the front bottom of the calendar.